Objective: To take the basic flat serve to new levels by adding powerful lower-body technique to the mix. When developing a game plan, players should keep in mind five basic offensive shots. When players develop each of the following shots, they will have a package of offensive strengths with which to build an overall offensive game plan. 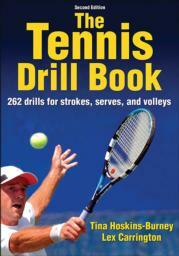 Objective: To help players develop quick thinking skills while hitting passing shots on the run. Tina Hoskins-Burney is a former professional player on the Women’s Tennis Association (WTA) and satellite tours and is a certified professional from the United States Professional Tennis Association (USPTA). She has trained and traveled with top pros, including Arthur Carrington, Lori McNeil, Zina Garrison, and Rodney Harmon. Hoskins-Burney has more than 30 years of experience in both playing and teaching tennis to all age groups and ability levels. She has helped many young players achieve USTA rankings, find jobs as teaching professionals, and achieve college scholarships. For over 20 years, Hoskins-Burney worked as the head tennis instructor at a prestigious racket club in New Jersey before relocating to Nantucket, Massachusetts, where she continued her teaching at a private club before branching out on her own to offer instruction and equipment through the Tennis Loft. Lex Carrington has over 20 years of experience coaching both recreational players and athletes who have gone on to play for top Division I, Division II, and Division III varsity tennis teams. He has spent the majority of his career working with junior players. In addition to several other professional players, Carrington coached Vera Zvonareva for four years. Achieving a career-high No. 2 world ranking by the WTA, Zvonareva was a finalist at both Wimbledon and the U.S. Open in 2010.